Our suites are cosmopolitan, touched by history. Stunning in every detail and beautifully designed our Junior Suites with Balcony offer guests a balcony with astonishing view to the Saint Sava temple to enjoy. Assuring you a memorable stay these rooms feature a comfortable seating area, executive desk and large bathrooms. With carefully selected decoration our unique Junior Suite represents subtly different personality and design. Tailor-made for modern ladies and gents designed with the attention to the smallest details featuring a big makeup mirror, oak wooden floor and spacious bathroom. Being a cultural heritage of Belgrade city this balcony offers a view to the Saint Sava street and a beautifully designed room with special attention to details, textiles and choice of materials used. Besides having a relaxing seating area with signature sofa and table the interior design of this suites resembles the unique charm of modern and retro. On complimentary basis, we offer you access to fitness and sauna, International landline calls, non-alcoholic minibar, Wi-Fi, Vergnano espresso coffee machine and early check-in or late check-out (upon availability). Our family suite consists of two adjoined rooms, offering one room with twin beds and one room with a balcony. 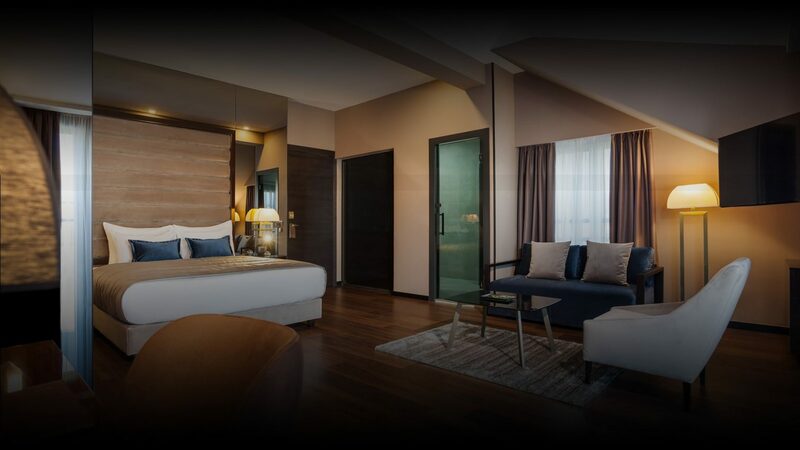 With an astonishing view to Saint Sava Temple, both rooms can be separated and feature world-class amenities such as noir cosmetics, Serta mattresses and separated beds for the younger family members. Treat yourself with our most spacious suite. Providing you more than 100 square meters of commodity our Executive Suite offers you two bedrooms and 2 bathrooms as well as a kitchenette, boardroom, living room with library and a terrace with beautiful view to Belgrade.